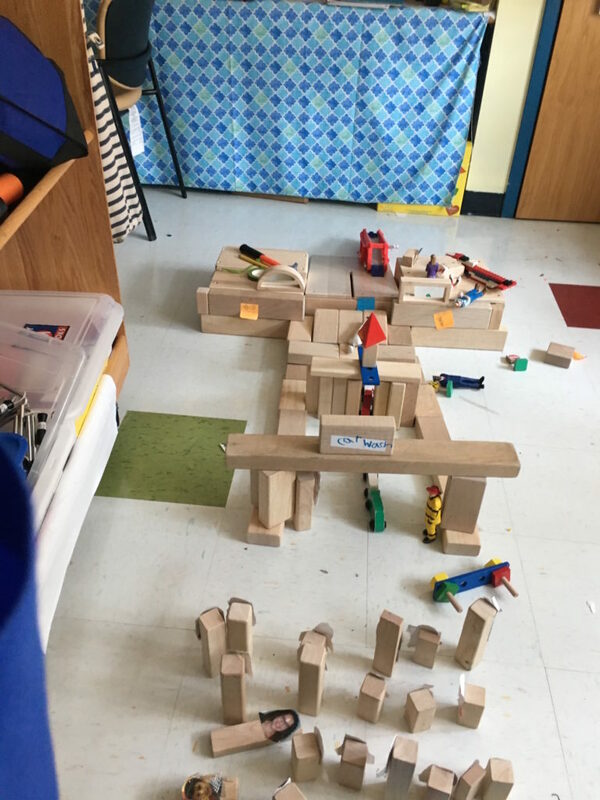 The block area in your classroom presents a perfect opportunity to encourage collaboration, creativity and curriculum connections. 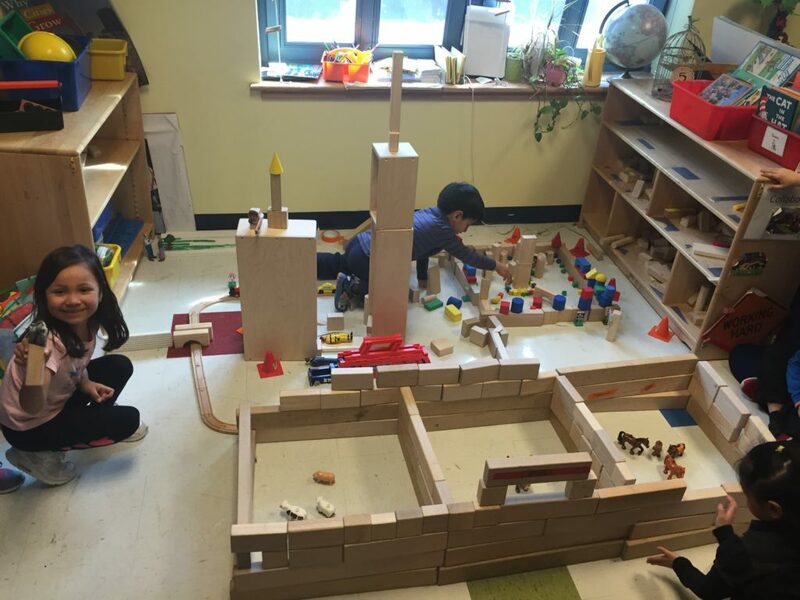 I’m going to share a little bit of what has been happening in two New York City public school classrooms. 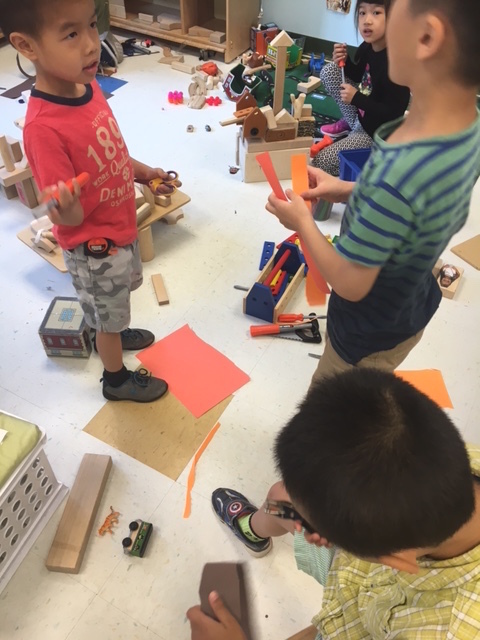 The teachers noticed that the children who played in the block center seemed unfocused and were mainly involved in parallel play. We talked about some strategies to address this. The first step was a class block lesson. 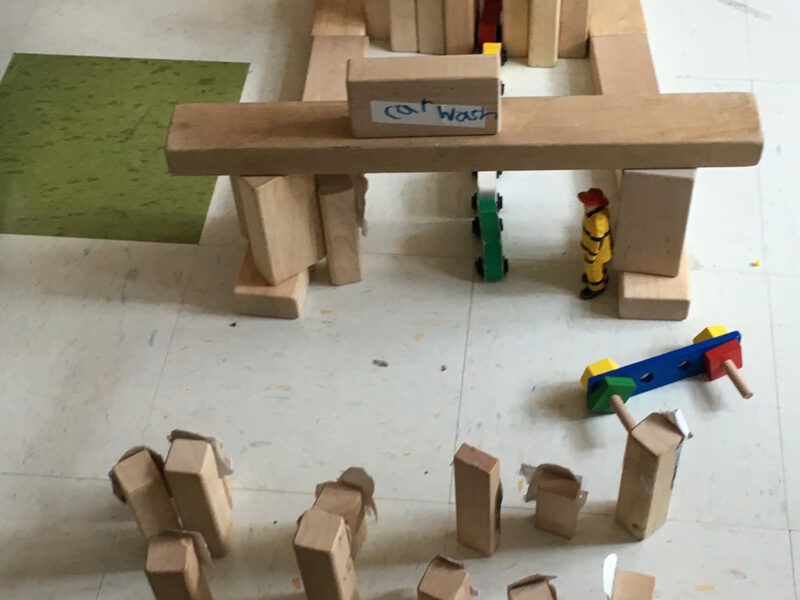 The children sat in a circle and each child was invited to pick one block from the block center, any size or shape, return to the circle and put the block on the floor behind them. 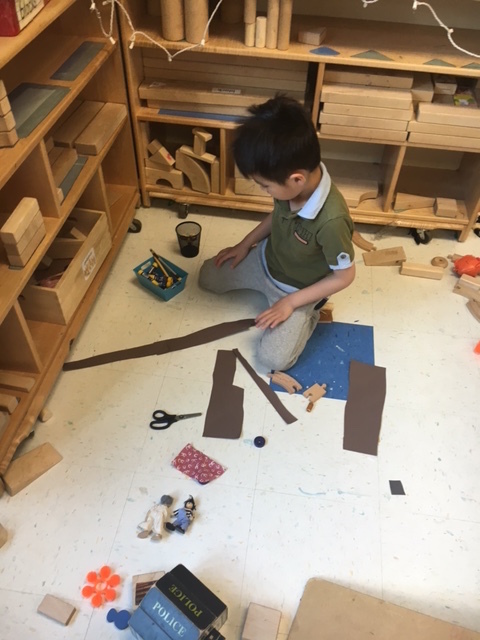 Then, one by one, each child had a turn to add his or her block to a growing construction. The only rule was that their block had to touch another block. As blocks were added, the children made observations about what the structure looked like. “It’s a letter y” “Oh, now it looks like a house.” “The house is getting taller.” “It’s a skyscraper”. This activity was done a few times during the next two weeks. 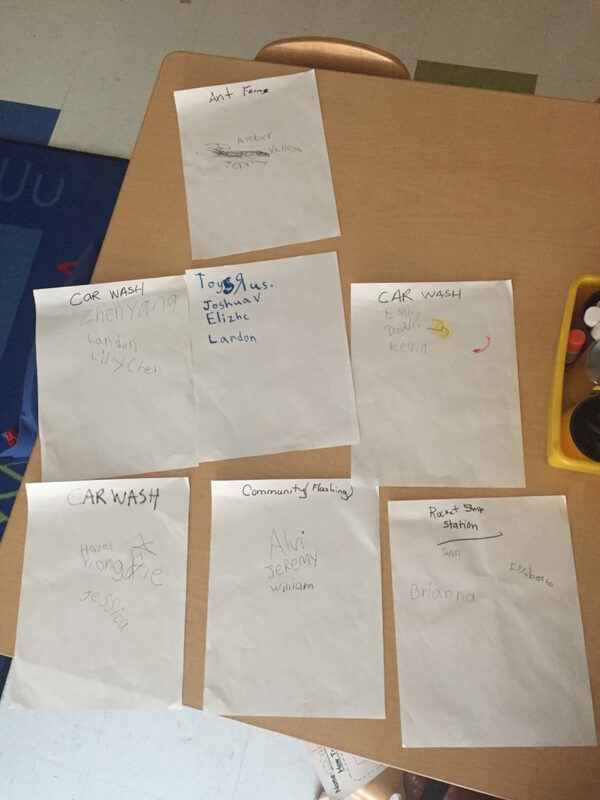 Then the teacher, at meeting, asked the children for ideas of what could be built in the block center. They had many suggestions that she charted. 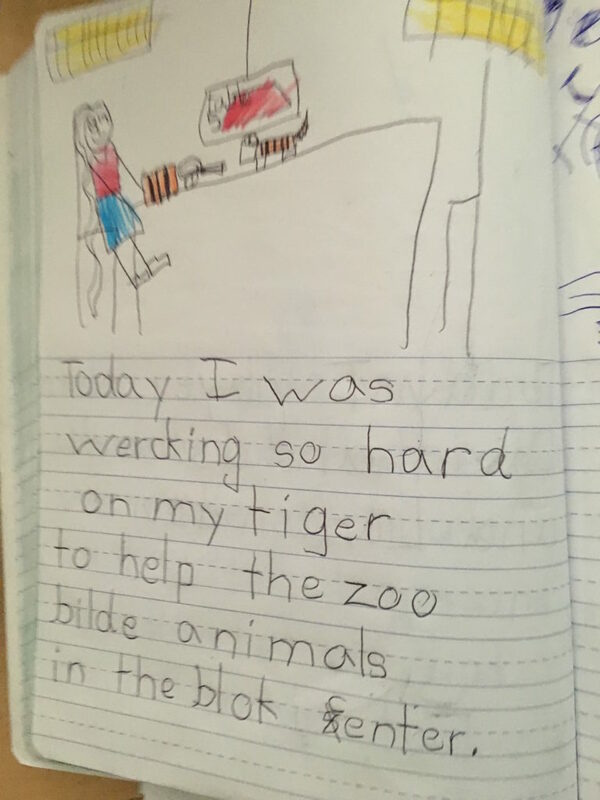 A zoo. Central Park Zoo. A Car Wash. A City. A Space City. After children had time to come up with ideas, the teacher excitedly told them of her idea. She told them that the next morning, when they came into the classroom, there would be sign up sheets for working with a team at the block center. Each team could have four builders. Each team would have a full week to work together in the block center. The children were psyched! When they came into the room the next day, the sign up sheets were spread out on the different tables and children excitedly signed up on one of the sheets. To our amazement there was no conflict about which sheet to sign up on. We anticipated that there might be a problem but we were pleasantly surprised. After the sheets were signed, each group had time to meet and decide what they would be building together. Then each group was given a week to work together. At class meetings, there were discussions about materials and blueprints. What was interesting was that some groups came up with their own ideas for creating blueprints. They cut strips and shapes from construction paper that they could move around until it pleased everyone. Some groups had changed the focus of their project by the time their week came up. That was fine! 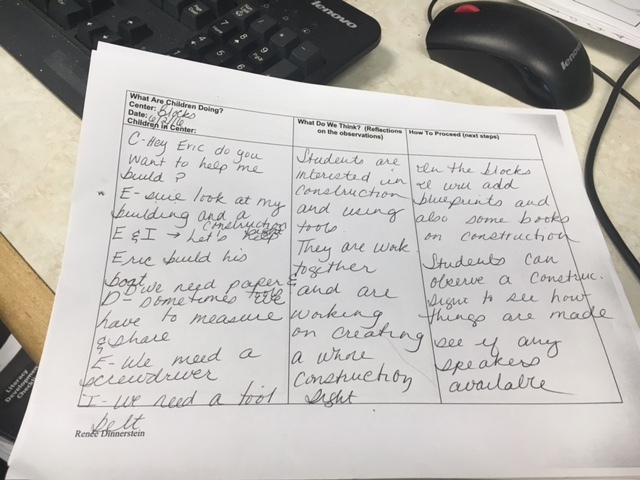 One group thought of their work in terms of the construction that they saw happening in the neighborhood. 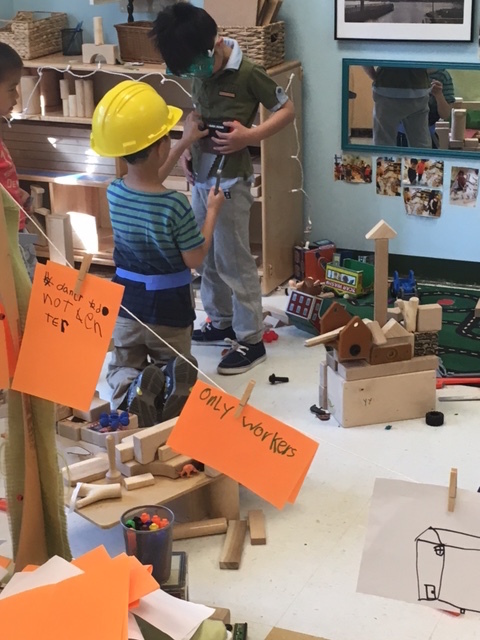 They wore hard hats and goggles and added plastic tools to the center. Always, though, there was so much collaboration and pride. 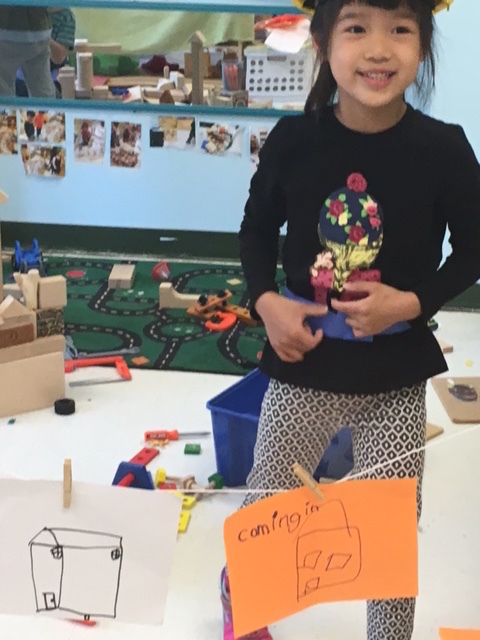 One group worked on building a carwash. One week the builders were constructing the Central Park Zoo but they felt like they needed more animals. 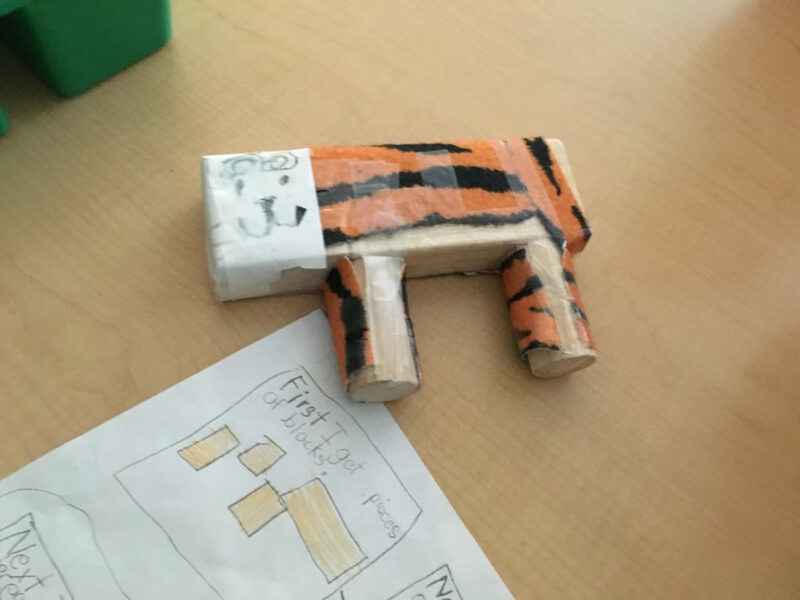 The teacher suggested that the children in the art center might consider constructing some animals for the zoo. 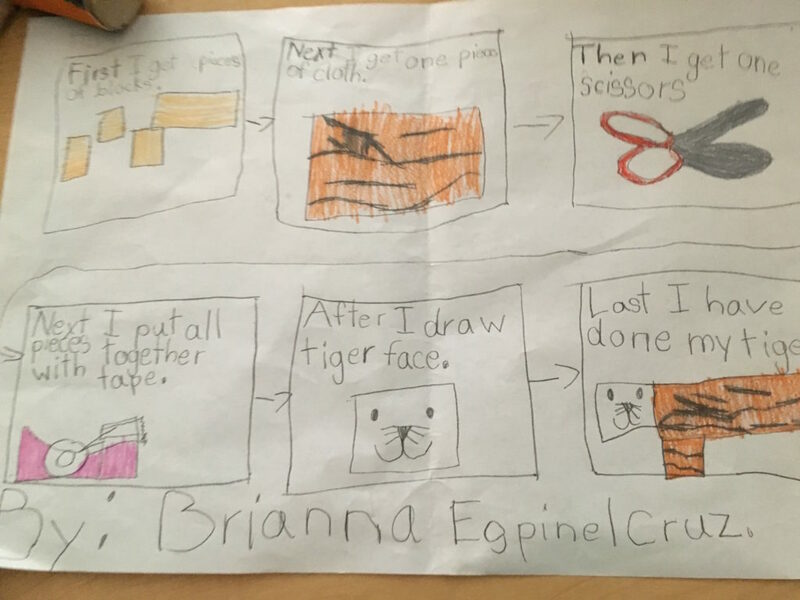 Here’s how one girl planned out and executed the construction of a tiger. Every once in a while, the teacher sat at the side of the center and jotted down some observations. Later in the day she used these notes to reflect on what was happening and to plan next steps to help scaffold the play. I might consider opening a real woodwork center, but that’s another blog post in the future! This wonderful work didn’t happen overnight. The teachers first worked really hard to rearrange their classroom environment so that there was plenty of space in the center for building and that the center was protected from the active movement in the classroom. 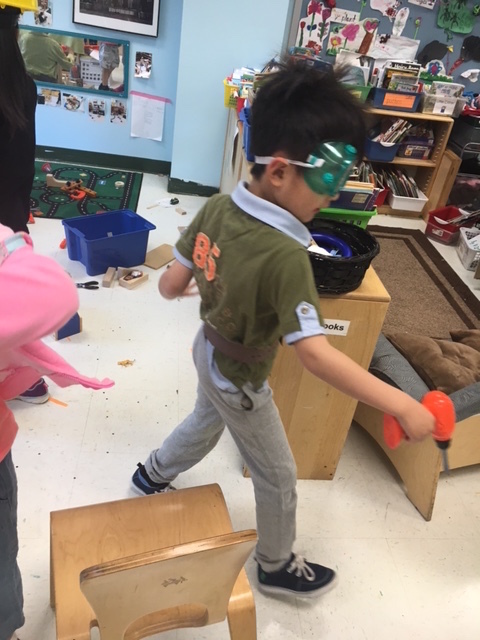 They were also careful to arrange the blocks so that children could see the mathematical relationships between the different sizes and so they could be easily accessed and returned during the clean-up period. It has been so exciting for me, the staff developer, to observe the growing excitement of the children and the satisfaction and joy of the teachers. Bravo to them! 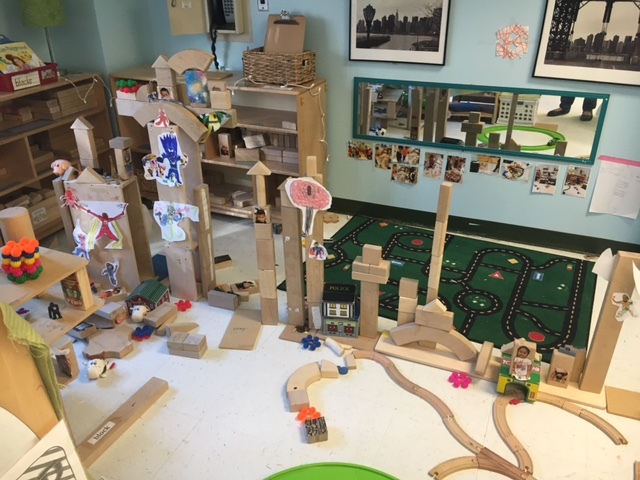 This entry was posted in Investigating Choice Time: Inquiry, Exploration, and Play and tagged blocks, carwash, Central Park Zoo, collaboration, parallel play on June 4, 2016 by Renee. Thanks for sharing this story, Renee! I think the decision for the work groups to have a whole week to build and create is a significant one. Too often we rush children through their learning to get to the ‘next thing’ and they only learn that to be a good learner is to get things finished quickly! 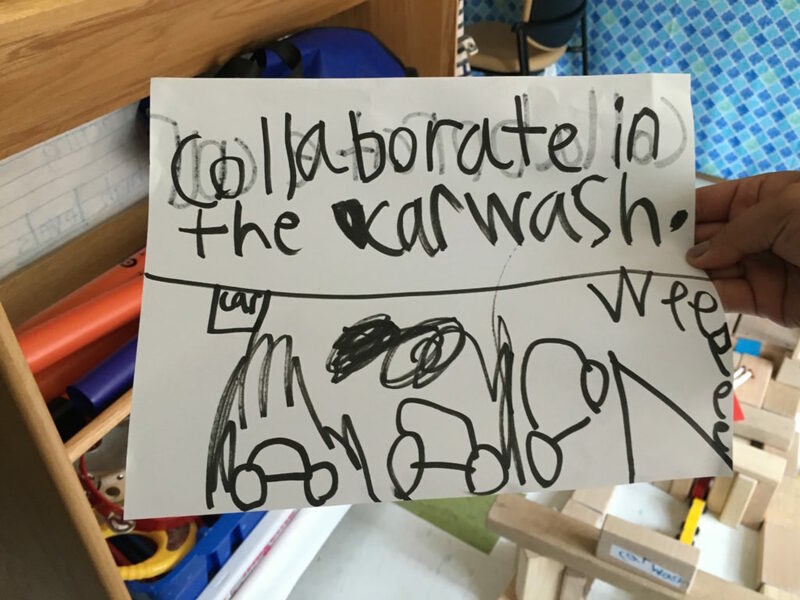 Children need time to become deeply involved, to be creative, to build the relationships needed for collaboration. Absolutely Lisa. That’s why I think it’s important for children to be able to return to centers and continue with their work/play.